Our aim is to raise awareness and to stimulate reflection and debate on topics related to ethics and care. 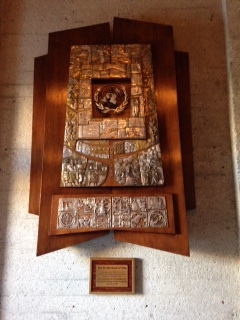 The AIDS Interfaith Chapel in Grace Cathedral serves as a memorial to the 20,000 people who died from AIDS in San Francisco. Symbols of world faiths surround one of the doors and a book of names remind that the city was at the centre of a tragic epidemic. 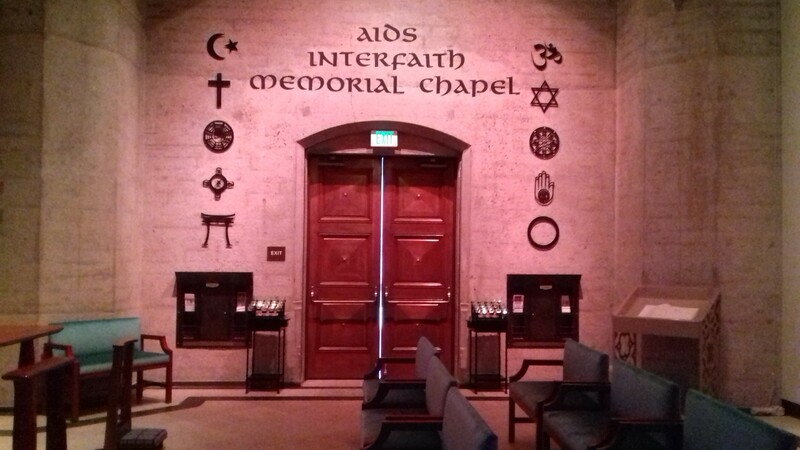 The chapel is a sanctuary where people come to remember loved ones who died and to give thanks for ethical leadership that underpinned the care and treatment response to AIDS and HIV. I visited one of the hospitals that responded most effectively to AIDS. 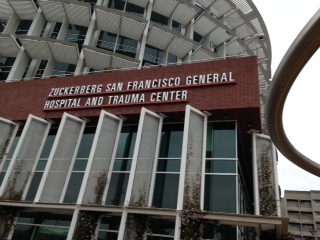 It is now known as the Zuckerberg San Francisco General Hospital and Trauma Center (ZSFGH) due to donations from Mark Zuckerberg and his paediatrician wife, Priscilla Chan (see https://finance.yahoo.com/news/san-francisco-general-hospital-foundation-225831565.html). I wondered if philanthropy is more common in the USA than the UK? Or is it just more visible? Or perhaps more necessary? ‘The Hospital’s response to the AIDS epidemic which has won worldwide acclaim is the successful outcome of the partnership between SFGH and UCSF. The open communication between the community, the researchers and the clinicians provided an environment for compassionate care as well as a stepping stone for public policy.’ (see also https://uk.video.search.yahoo.com/search/video?p=we+were+here+utube+AIDS&fr=yhs-invalid#id=6&vid=601feb620bb479d853c51381a328021f&action=view). 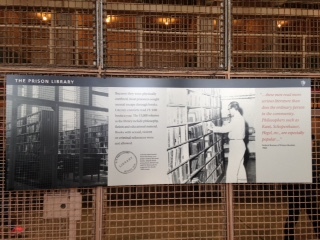 What was clear is that the focus at Alcatraz Prison was on punishment and public safety and not on rehabilitation. Nevertheless, some prisoners made good use of the prison library where they could read Kant, Hegel and other philosophers. Coincidentally, this week I attended a panel discussion in the Jewish Cultural Center, on the theme of solitary confinement in US prisons. One of the panel members was a woman who had experienced imprisonment. Her son is in prison and had been on hunger strike to draw attention to the inhumane nature of solitary confinement. Panel members detailed prison-related social justice initiatives which are supported by the Jewish community. One such initiative was the organisation of transport and food so family members’ could make long distance prison visits. The large number of people imprisoned in the USA may be surprising to you (is it?) and raises human rights questions with care implications (see https://www.prisonpolicy.org/reports/pie2018.html). I have met many inspiring people in San Francisco. At ZSFGH I talked with Dr Anna Chodos, a passionate and impressive geriatric medicine specialist, determined to improve elder care and committed to responding ethically to socially vulnerable elders who have compromised capacity and who are ‘unbefriended’ and unrepresented. I’ve also been privileged to have informative conversations with Julene Johnson, Christine Ritchie, Jeff Newman, Krista Harrison and Brooke Hollister at UCSF (https://www.ucsf.edu/) and Tim Godfrey and Donal Godfrey at the University of San Francisco (https://www.usfca.edu/). All are engaged in creative and committed research, practice, education, chaplaincy and policy initiatives to promote and sustain ethical care for all. Current research by Professor Barbara Koenig and Lindsay Forbes illustrates the value of bioethical leadership when the law relating to assisted dying changes (see, for example, http://www.eoloptionacttaskforce.org/2015-conference.html ). Professor Koenig’s research relating to culture and bioethics is also illuminating (see, for example, https://onlinelibrary.wiley.com/doi/abs/10.1111/j.1748-720X.2004.tb00472.x). The visit to ZSFGH brought to the fore two other challenging social issues, that of homelessness and gun violence. The hospital cafeteria serves as a sanctuary for a few of the many people who appear to be homeless in San Francisco. A few hours after my visit to the hospital, there was a ‘shoot-out’ in the local Mission area resulting in 5 people (including a policeman) being brought to the ZSFGH emergency room with gunshot injuries. The large turnout at last weekend’s ‘March for our Lives’ shows that America’s young people care about gun control and want change. This is an issue David Hodge and I have written about in a recent Nursing Ethics Editorial (see http://journals.sagepub.com/doi/pdf/10.1177/0969733017751936 ). I learnt this week that the United Nations was founded in San Francisco on June 26th 1945. There is a wooden hanging to commemorate this in Grace Cathedral. It is helpful to contextualise our reflections on local issues in global terms…. San Francisco is a ‘Sanctuary City’ in a ‘Sanctuary State’. This means that the city and state have policies in place to limit co-operation with federal immigration enforcement agencies. 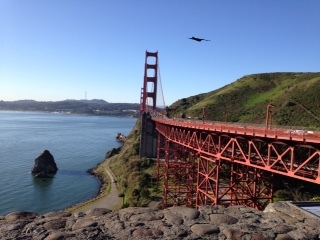 It is not difficult to understand why so many people choose to come to San Francisco. It is a beautiful city with a mild climate, a wide range of services and residents who are generally liberal, warm and welcoming. However, providing sanctuary to those with complex health and social care needs – particularly those who are homeless – is challenging. As I leave San Francisco it seems appropriate to return to the theme of ethics and elder care. Two elders who live in the city and who can be described more appropriately as ‘chronologically gifted’ or ‘experientially enhanced’ are Anne Davis and Hanna Regev. Anne Davis is a leader in nursing ethics and an octogenarian. She helped me with sabbatical arrangements and kept me on my toes in conversations about local and global issues (before and after her travels to Israel). Anne is a great believer in ‘fun’ and distinguishes between ‘work fun’ and ‘fun fun’. She ensures she continues to have an abundance of both. Hanna Regev, a friend of Anne Davis, guided me around the Mission wall murals and told me about the wide range of art exhibitions she curates including some with and for elders. Two inspiring women, two fascinating life stories and two women who continue to make a difference to their communities in their ‘vintage years’. As I leave San Francisco I can confirm that I have had much ‘work fun’ and look forward to the next chapters of my sabbatical journey to China and Japan. I look forward to telling you about this later in April. In the weeks to come I will also be working with Visiting Professor Christopher Herbert on our edited collection of chapters relating to ethical implications of 11 world views on care-giving. More about this in due course.